Some people take a server at her word when she chirrups, “save room for dessert!” My husband is not one of those people. His lack of a sweet tooth when paired with my overly enthusiastic one sets us up for an end of meal conundrum that more often than not entails a response of “check, please.” That is, unless we visit a restaurant that equates end of meal indulgence with a cheese plate. Then all bets are off. I tend to coo over the pairings that come with the cheese- the membrillo or fig cake, the scattering of nuts or wedge of honeycomb all thoughtfully curated to combine in a perfect bite that silences us as we arrive in a state of blissed out cheesy Xanadu. A few substitutions were made in cooking this recipe. We swapped in gluten-free rotini instead of the shell pasta and used all 12 oz. of the pasta in the Bio-Natur bag, though Jovial noodles are usually the box of pasta you might find in our pantry. And if you’ve never eaten gluten-free noodles before, be advised they are not really palatable as leftovers, so plan ahead and invite some friends to partake of a freshly made pot of this mac and cheese. For the flour, I used King Arthur Gluten-Free AP flour to build the sauce. 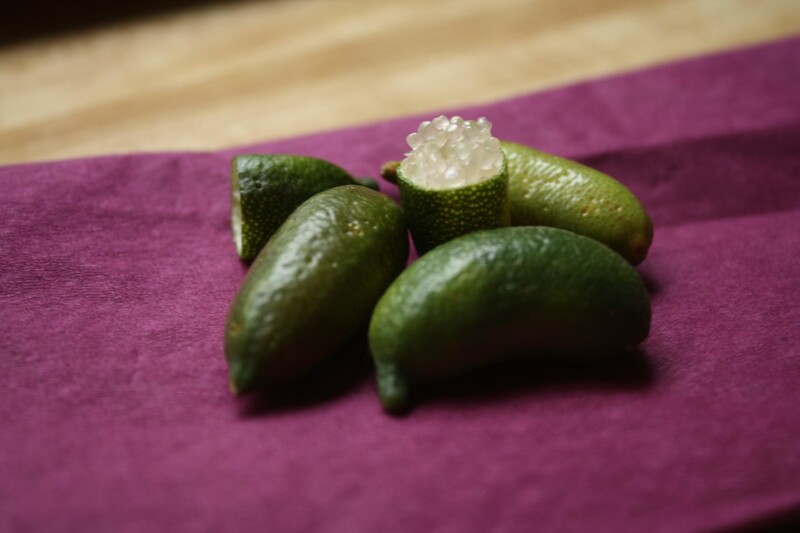 Also, and just because a bit ago I picked up some finger limes at IFBC, we cut them in half and squeezed out the lime arils, garnishing the pasta with that final pert burst of citrusy flavor instead of the lime juice called for in the recipe. The finger limes give an intriguing pop of flavor and texture to a dish already complex and completely decadent. Remove the stem from the jalapeno and cut the jalapeno in half. Remove the ribs and seeds- or keep them, depending on how much heat you like. Toss the jalapeno into the bowl of a food processor with the lime zest and lime juice. Add green onions, garlic and flesh of 2 of the avocados. Blitz together into a very smooth paste. Cook the pasta in a large pot of salted boiling water until al dente. Drain through a colander and set aside. To prepare the mornay sauce, heat the milk in a small saucepan over medium heat. As soon as the milk starts to steam and tiny bubbles form around the edges of the pan, turn off the heat. Place the butter in a medium saucepan and melt over medium flame. Add the flour and stir with a flat-edge wooden paddle just until the roux begins to take on a light brown color, scraping the bottom to prevent burning, about 3 minutes. Slowly add the milk and stir constantly until the sauce thickens enough to evenly coat the back of a spoon- a finger drawn along the back of the spoon should leave a clear swath, Remove from heat and stir in salt and pepper. Add cheese to sauce, stirring until completely melted. Add the avocado-onion paste and whisk together until uniform and creamy. The key word here, if you haven’t guessed is smooth. Season with more salt and pepper to taste. Add the pasta and cilantro to the sauce and stir together. 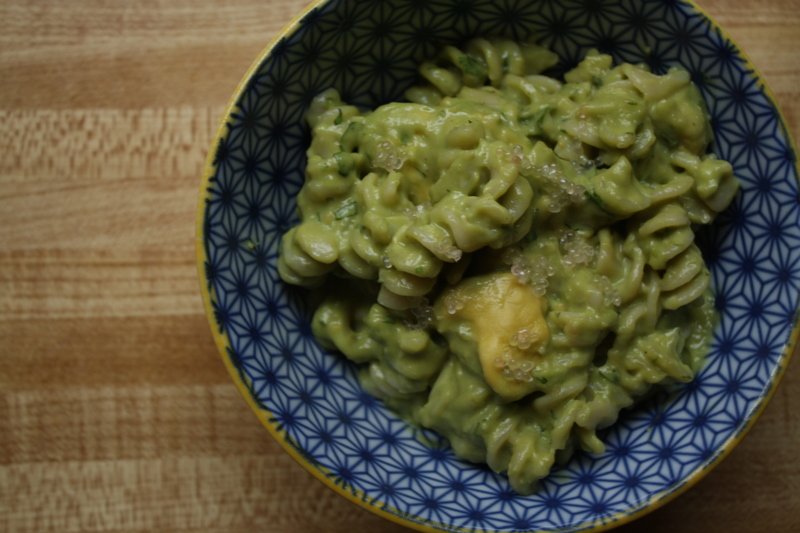 Dice the last avocado and toss together with the mac and cheese. Serve immediately with a splash of lime juice. I am sending this to my friend! She is a recently engaged mac & cheese enthusiast 🙂 Thank you so much for sharing it. Danielle, thanks for sharing it. If she is a mac and cheese enthusiast, this will blow her mind. What can we say, Steph, you and Garrett really got into the nuts and bolts of cheese with some really well thought out recipes. There are so many more we want to try! Fantastic review Annelies! You brought the book to life in such a unique way. If I didn’t already own the book I would run out and buy a copy today!! Thanks Jane. I’m glad you can tell we enjoyed cooking from it. Last night we made the Grand Ewe with Golden Raisins, Pine Nuts and Macaroni. Three other people can vouch for how good that one was, and I can attest to it being so completely different from the Guacamole Mac. We are going to continue having fun with Melt. Guess what I just asked for for Christmas?! This looks like the best book! 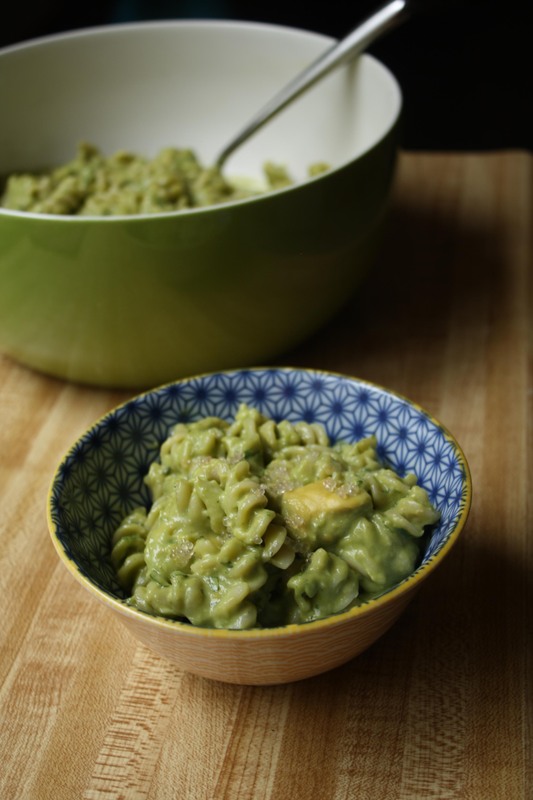 I definitely want to try this Guacamole Mac – what cheddar do you think I should use if I can’t get Beecher’s? 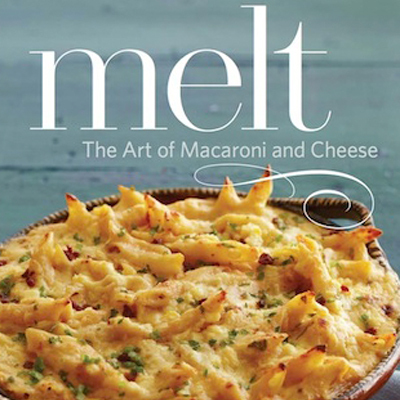 Ooh, Sharona, if you are a cheese plate lover, this cookbook is going to inspire your mac and cheese to hit new levels. I would go with a robust cheddar for this mac and cheese. We too didn’t have access to Beecher’s, so I used a Clothbound Cabot Cheddar (which really shone through the other flavors so well). Great write-up Annelies. I am excited to try some recipes that will work with our lactose intolerant household – with hard cheeses like cheddar and goat and sheep alternatives. I still love my blue box (now it’s Annies) but this is a whole different animal that people should realize is an option beyond the blue box. Right, Beth? I was really blown away (so far with the two recipes we have prepared from Melt) that the character of the cheeses really stands out. Happy cooking! Perfect time of year for this review! I love your uplifting responses to life’s challenges. I’m going to work on that all week. Tammy- these are quite possibly the best consolations to life’s challenges. If we can bring artisan cheese into the conversation somehow wrongs can be reversed, right?